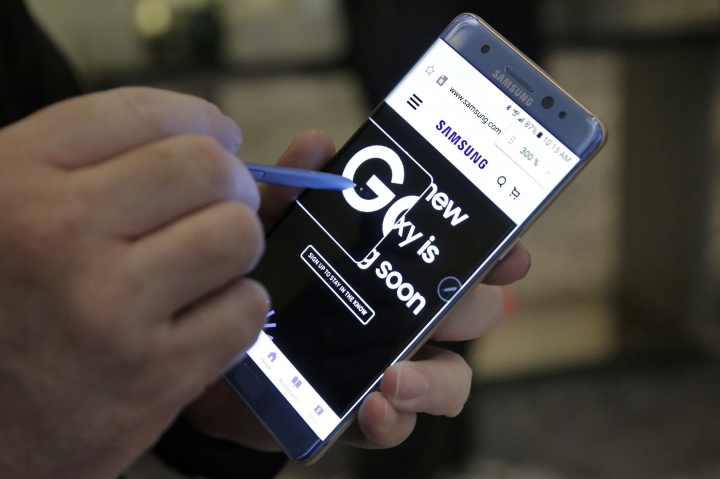 SAN FRANCISCO — U.S. safety regulators announced a formal recall of Samsung's Galaxy Note 7 smartphone Thursday after a spate of fires led to injuries and property damage — along with a global marketing headache for the South Korean tech giant. "Because this product presents such a serious fire hazard, I am urging all consumers ... to take advantage of this recall right away," said Elliot Kaye, chairman of the U.S. Consumer Product Safety Commission. Samsung had already initiated a voluntary recall, but the company has been criticized for not offering clear information about the problem or how it would be resolved. While speaking with reporters, Kaye appeared to blast Samsung for not coordinating with his agency. "As a general matter it's not a recipe for a successful recall for a company to go out on its own," he said, adding that anyone who believes a unilateral effort would be sufficient "needs to have more than their phone checked." Samsung has said the problem involves about 2.5 million smartphones worldwide; authorities say that includes about 1 million in the United States. While the company was previously offering to replace the phones, it will now offer consumers the choice of a replacement or a full refund. The recall comes as Samsung is locked in a fierce battle with Apple for the attentions of high-end smartphone buyers. Apple just introduced the latest versions of its iPhone, which go on sale Friday. Samsung had beaten Apple to market with the Note 7 by several weeks. It was drawing favorable reviews for the phone, which started at $850 in the U.S., before consumers began reporting problems with the battery overheating, sometimes causing fires or explosions. One family in St. Petersburg, Florida, said a Galaxy Note 7 left charging in their Jeep had caught fire, destroying the vehicle. Samsung has received 92 reports of the batteries overheating in the U.S., including 26 reports of burns and 55 of property damage, according to the U.S. commission's website. It said property damage included fires in cars and a garage. Meanwhile, U.S. aviation safety officials have taken the unusual step of warning airline passengers not to turn on or charge the phone during flights, and not to put them in checked bags. 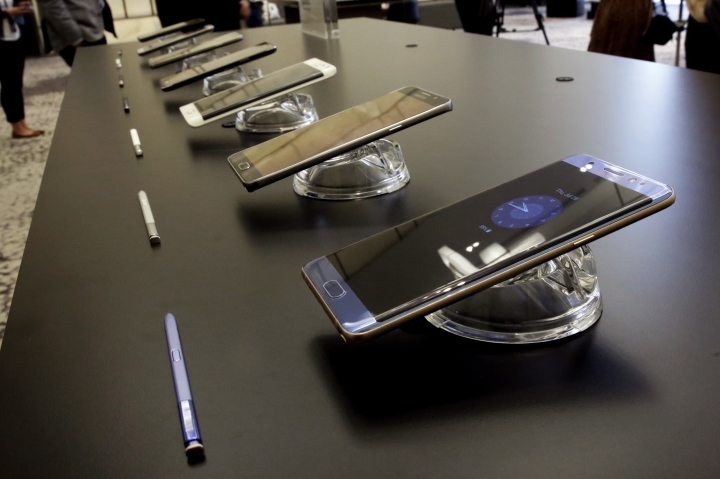 A top Samsung executive in the United States on Thursday apologized to customers and pledged to expedite the recall. "We did not meet the standard of excellence that you expect and deserve," said Tim Baxter, president of Samsung Electronics America, in a video released by the company. Critics say Samsung didn't follow commission rules that call for companies to coordinate the handling of recalls with the commission, including the use of joint public announcements, although Baxter said Thursday that his company notified the commission before it announced it would stop selling the Note 7 on Sept. 2. Samsung announced then that it would replace any Note 7 phones it had sold, with replacements available within a week. But its press releases didn't tell consumers to stop using the device. Samsung's statements left many customers confused, said Tuong Nguyen, a tech industry analyst with Gartner, "and that might have an impact on overall consumer confidence, especially since we're talking about a high-end device, their flagship phone." People who bought the phone did so to get the best possible quality and service, he said, adding that the handling of the recall "kind of seems like a strike on both counts." Some purchasers of the Note 7 say they're willing to try another Samsung device. "I think I would," said Robert Lerner, a 64-year-old financial consultant who lives in the San Francisco Bay Area. "But I'm not going to go get it the first week," he added, because he wants to make sure there aren't more problems with the Note 7 replacements. Brooklyn office worker Joe Franco said he was frustrated, especially after getting conflicting information from his cellphone carrier, Sprint, about how to get a replacement. "I love the phone. It's an excellent phone. But I'm scared it's going to explode," said Franco. The 23-year-old said he's currently using an old phone borrowed from a friend, which he said was "really impractical." Samsung said Note 7 owners who don't want a refund can choose to get a new Note 7 — which the company now says will be available in the U.S. by Wednesday — or the smaller and cheaper Galaxy S7 or S7 Edge right away, with a refund of the price difference. Speaking with reporters on Thursday, Kaye at the consumer safety commission said Note 7 purchasers should check the back of their device for an identifying number, and visit Samsung's recall website or call a hotline at 1-844-365-6197 to find out if the device needs to be turned in. If so, consumers can take the device back to Samsung or to the phone carrier that sold it. 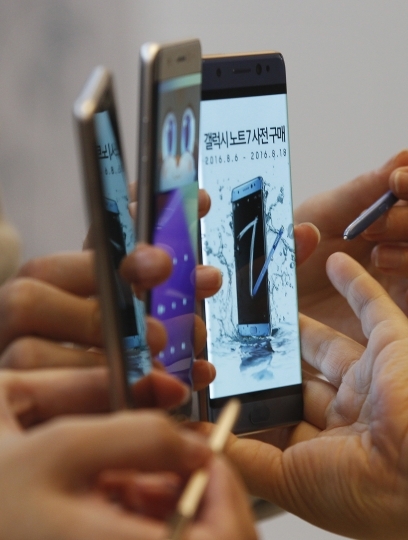 About 97 percent of phones sold in the U.S. are being recalled.